Unser Referenz DAC. Etwas musikalischeres haben wir bisher noch nicht gehört. Produktdetails zum REX DAC finden Sie hier. Balanced Audio Technology, kurz BAT, ist der Name einer amerikanischen Verstärkerschmiede aus Wilmington im zweitkleinsten Staat der USA, Delaware. Den Gründern Victor Khomenko und Steve Bednarski, zwei ehemaligen Mitarbeitern von Hewlett-Packard, geht es vor allem anderen um einen "balancierten" Über-Alles-Klang. Seit der Gründung 1995 verfolgt BAT konsequent, kompromisslos und erfolgreich dieses Ziel. Daher haben diese exzellenten Produkte einen Stammplatz in unserem Angebot. All you need is listen! Wenn Sie auf der Suche nach einem kompromisslosen High-End Vorverstärker sind, sollten Sie sich die BAT Vorverstärker unbedingt anhören. BAT ist für seine High-End Endstufen in Dual Mono Ausführung bekannt. Unabhängig davon, ob Sie eine Röhren- oder eine Transistor-Endstufe suchen, sollten Sie die BAT Endstufen zur Probe hören. Die BAT Vollverstärker basieren auf dem Schaltungsdesign der Vor- und Endstufen. Wenn Sie jedoch eine kompakte all-in-one Lösung bevorzugen, werden die BAT Vollverstärker Sie ganz sicher nicht enttäuschen. Alle Details zu den Vollverstärkern finden Sie hier. Der BAT DAC ist unsere Referenz im Bereich DAC. Den sollten Sie gehört haben! Für unsere Kunden bieten wir für den Vollverstärker VK-3000SE, den Vorverstärker VK-53SE sowie den REX DAC Testpakete an. Wer glaubt Vorverstärker sind unnötig, der hat den VK-53SE von BAT noch nicht gehört. Für uns der beste Vorverstärker am Markt. Produktdetails zum VK-53SE finden Sie hier. Eindeutig der für uns beste Röhren-Vorverstärker am Markt, da scheuen wir keinen Vergleich. The VK-53SE is the finest single-chassis preamplifier ever offered by Balanced Audio Technology. It features a transformer-coupled, high-current, single gain-stage topology. The transformer-coupled outputs catapult the performance of this fully balanced, zero-feedback design to a higher level. These transformers replace BAT’s venerable Six-Pak of output capacitors with custom-designed amorphous core output transformers. Each is encapsulated within a mu-metal shield for the ultimate in signal purity and noise isolation. Electrically, the custom transformers significantly improve the VK-53SE's ability to drive low-impedance loads. Sonically, they offer greater dynamics, transparency, top-to-bottom extension, and a more coherent, organic portrayal of music. The VK-53SE preamplifier now features transformer-coupled outputs. These transformers replace BAT’s venerable Six-Pak of output capacitors with custom-designed amorphous core output transformers. Each transformer is encapsulated within a mu-metal shield for the ultimate in signal purity and noise isolation. This change to transformer-coupled outputs has a solid engineering foundation. All devices have inherent imperfections. Yet, while both capacitors and transformers can perform the same task of DC decoupling, in many cases the transformer can be designed closer to the model of an ideal device. This benefit, however, does not come easily. First - the design of a linear, and close-to-ideal, transformer is not trivial. Second - some applications are more suitable for transformers than others. And third - the highest quality transformers are also quite high in cost. The combination of these three elements explains why good transformers are relatively uncommon in high-end audio. In order to achieve this “transformational” goal, years were spent in prototyping and testing various output transformer designs. The result: BAT’s new transformer-coupled output stage proved itself to be substantially superior to any capacitor in maintaining a purity of signal transmission. Electrically, these custom transformers significantly improve the VK-53SE preamplifier’s ability to drive low impedance loads. Sonically, they offer greater dynamics, transparency, top-to-bottom extension, and a simultaneously more coherent and organic portrayal of music. Simplicity of design, especially in the direct signal path, has always been the hallmark of Balanced Audio Technology’s purist approach to circuit topology. Some advocates of this purist approach like to talk about a "direct wire with gain" as being the ideal circuit. The VK-53SE preamplifier deftly meets this simple design criterion. Effectively, the signal in the VK-53SE preamplifier is transmitted through only one gain stage. It is a design that is free from the negative artifacts attributable to both extremes of modern preamplifier designs: passive preamplifiers at one end of the spectrum and multi-stage buffered active circuits at the other. The benefit of the UnistageTM circuit is that it provides the ultimate simplicity of amplifying the incoming signal only once, while using no global feedback to double back on the straight-through integrity of that signal. Imagine telling a joke to your friends and telling them to “pass it on”…. Pass it on enough times and you won’t recognize the joke. Pass the music through too many gain stages, and you’ll no longer recognize the genius and beauty of your favorite recordings. Well over a decade ago, Balanced Audio Technology introduced the world to the 6H30 SuperTube with the introduction of the VK-50SE preamplifier. Today, most all of our major tube competitors have followed Balanced Audio Technology’s lead by designing their own reference products based on this stellar vacuum tube. As the fourth generation of our renowned VK-5x series of preamplifiers, the VK-53SE preamplifier continues to proudly use eight of the 6H30 SuperTubes to form an extraordinarily high-current, low impedance drive capability. As we had written upon introduction, “comparing the 6H30 tube to a standard 6922 is like comparing a Formula 1 race car to a family sedan.” Balanced Audio Technology is certainly proud of having the longest “track record” in using this stellar device. Of course the VK-53SE preamplifier is balanced. Balanced Audio Technology staked its reputation on this principal of circuit design from day one. Today, it isn’t hard to find many followers in the industry. Why have we always believed that balanced is better? In our opinion balanced topology simply provides a complete signal representation. Something magical happens when you free yourself from the limitations of the single-ended structure with its half-signal processing. If a one-handed craftsman can be very good, imagine what he could do with two hands. It is fairly common to associate the benefits of balanced design with improved signal integrity when dealing with long interconnects, for example. In fact, the true benefits of a balanced approach to circuit design go much further than signal transmission. These benefits include such fundamental aspects of design as the interaction between the power supply and its associated gain stage. It is now common wisdom that the power supply should be considered a part of the signal path. However, whereas the sonic contribution of the power supply can be overwhelming in a single-ended design, it is much less of a concern in a balanced circuit. As the circuit becomes more symmetrical, the residual effect of the power supply becomes less intrusive. In effect, the demand on the power supply is reduced, making it easier to design a balanced circuit that conforms more closely to the engineering ideal. The VK-53SE preamplifier employs a proprietary electronic shunt volume attenuator that offers one hundred and forty steps of 0.5dB resolution. Only a single Vishay bulk foil resistor per phase – the most precise and thermally stable resistor available – is in the signal path. Discrete metal film resistors are used to bleed the unused signal to ground. With this circuit, only the highest quality Vishay resistor is in series with the signal. In addition, the one hundred and forty steps give precise repeatable volume settings that sound continuous to the human ear. With the VK-53SE preamplifier, you can always get the volume just right! The VK-53SE preamplifier is easy to use right out of the box. It is also just as easy to customize! Its user interface has been widely acknowledged to be one of the best and perhaps the most flexible in the industry. You can dim the display (or turn it off entirely) from the comfort of your chair by using the BAT remote. Fade the music gently at the touch of one button. Name your sources: for example, name your home theater playback input THTR. Fix the volume for your THTR input to allow easy master control of your home theater system from your pre/pro remote. Switch phase from your chair to see if a recording was made in reverse absolute polarity. The list of features is extensive. If you only use one of the many delightful features of the VK-53SE preamplifier, you may find it a godsend in making your audio setup perfectly tailored to fit your needs. The VK-53SE can be fully upgraded to the Rex II preamplifier. This well thought out engineering allows the VK-53SE to become the REX II Control Module when it is mated to the REX II Power Module. With this upgrade, each module will contain the supply for one polarity: positive in the Control Module and negative in the Power Module. 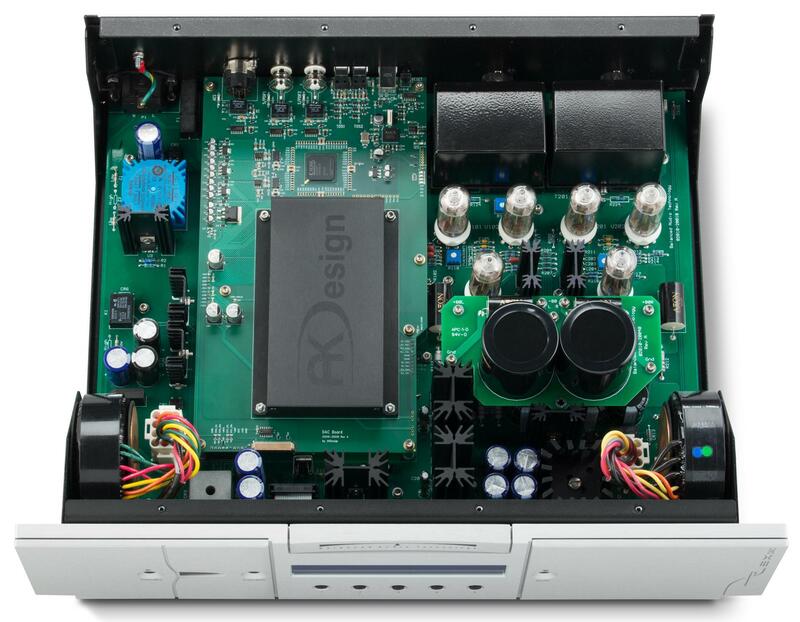 Balanced Audio Technology is proud of its long-term focus on serving the customer with welcome upgrades - which began with the first upgrade from the VK-5 to VK-5i line-stage preamplifier in 1997. Thus, the VK-52SE preamplifier can be fully upgraded to the VK-53SE preamplifier as well. Given the pedigree established by the superb VK-50SE through VK-52SE series of BAT preamplifiers, the VK-53SE certainly had a tough act to follow. As anyone who has heard the evolution of these BAT preamplifiers over time knows, each new model has been a noticeable improvement over the product that it replaced. Yet, the VK-53SE, with its new transformer coupled output stage, offers the largest step up in performance in the history of this world-renowned series. Every aspect of performance is improved. From the deepest bass, to extraordinary dynamics, as well as a greater sense of layered transparency - the VK-53SE is rightfully proud to take its place at the top of this preeminent podium. Eine phantastische Röhren-Endstufe mit 75 Watt, nicht nur für Hornlautsprecher ideal geeignet. Produktdetails zur VK-76SE finden Sie hier. Eindeutig der für uns beste Röhren-Endstufeam Markt, da scheuen wir keinen Vergleich. Dimensions: 17" x 8" x 24"
The Balanced Audio Technology VK-76SE tube power amplifier is design without compromise. Many upscale components profess such claims but fall short on the promise. Not the fully symmetrical VK-76SE. As the highly anticipated successor to VK-75, this empire-building component features a completely revised power supply, fuse-less protection circuit, active current sources for its two gain stages, intelligent auto-bias circuit with LED indicators, and high-current, all-triode, zero-feedback, fully balanced topology. BAT realizes serious listeners want unique technology, user-friendly experiences, and faithful-to-the-source sonics when considering luxury high-end equipment. The equivalent of having two single-ended amplifiers per channel, the wide-bandwidth VK-76SE meets these lofty demands and more—and sounds mesmerizing minutes after being plugged in. VK-76SE means there are no tubes to bias. No fuses to replace. No pentodes imitating triodes. No direct current present at the tube output stage. Why cede to lesser traditional audio engineering when you can own a tube amplifier on the forefront of the cutting edge? VK-76SE is the sound of the future—and musical truth. In a world of cookie-cutter pentode/tetrode designs and frail single-ended counterparts, VK-76SE is uniquely different. Its design is fully symmetrical from beginning to end. You can think of it as two single-ended amplifiers per channel, with their waveforms summed at the output transformer. Since no direct current flows through the output transformer, the latter is truly a wide bandwidth design that also reduces low-frequency distortion. When you combine VK-76SE’s fully symmetrical circuit with its high-current, all-triode, zero-feedback, fully balanced topology, all of the drawbacks of push-pull and single-ended amplifiers are banished. VK-76SE eliminates the traditional headaches associated with most vacuum-tube power amplifiers: The constant need to set and readjust the proper bias of the output tubes. VK-76SE features an intelligent automatic bias circuit that adjusts for changing line voltage and aging tubes. For convenience, the intelligent automatic bias circuit contains LED indicators that show the status of each individual output tube. It also ensures VK-76SE power amplifier sounds wonderful within the first few minutes of listening, entirely different from manually biased designs that must be adjusted for their thermally warm set point—and which sound cold and clinical before their tubes are warmed up. Based on decades of research that culminated in BAT’s reference-setting REX Series, VK-76SE extends plug-and-play simplicity with a novel fuseless protection circuit that eliminates the power supply rail fuses to provide both a more refined sonic performance and user-friendly experience. Just flip the power switch in the event of an output tube being over-stressed. It doesn’t get any easier! VK-76SE substantially improves upon the VK-75SE gain stage architecture by extending the benefits of active current sources to include both the first and second gain stages of the circuit design. The current source is an integral part of a differential circuit. Its quality primarily determines the ultimate performance of a gain stage. As opposed to a more common resistive solution, the active current source is much closer to an ideal model. There are multiple benefits to implementing active current-sources (solid-state as well as tube) for the first two stages of VK-76SE’s design. Specifically, the linearity of the gain stages improve; the adjustments for the first and second gain stages become independent and therefore more easily optimized; and the active source components operate at much lower stress level, improving reliability. The final result is an impressive improvement in the linearity of the design, yielding a more accurate representation of the output signal to the original input signal. That, in essence, is the measure of any amplifier. VK-76SE offers a robust 75 watts per channel in the stereo version and 150 watts per channel as a monoblock. Its 6C33C-B triode output tube provides many times the current delivery of the more common 6550 tube used in traditional push-pull designs. High-impedance vacuum tubes like the 6550 require far more complicated output transformers than the low-impedance 6C33C-B. Consequently, VK-76SE is quite comfortable driving low-impedance loads. VK-76SE carries on the BAT tradition of being easily upgraded from its stereo version to monoblock configuration. Unlike competing designs, there is no need for you to trade in your amplifier to obtain more power. With VK-76SE, you can simply convert your existing VK-76SE to a monoblock and then order a second VK-76SE monoblock to match. The stereo-to-monoblock conversion is accomplished by simply paralleling the inputs and outputs of the two channels. Thus, the monoblock sound only gets better as the current delivery doubles and the noise floor drops. Platzsparende Kombination aus Röhren-Vorverstärker und Transistor-Endstufe, inspiriert von den High-End Einzelkomponenten. Produktdetails zum VK-3000SE finden Sie hier. Für uns der eindeutig beste Hybrid-Vollverstärker am Markt, da scheuen wir keinen Vergleich. Der Vollververstärker Balanced Audio Technology VK-3000SE verkörpert Einfachheit und Kompromisslosigkeit. Benannt nach seinem Schöpfer Victor Khomenko, dem Co-Gründer von BAT, wurde er geschaffen um die Bedürfnisse selbst der anspruchsvollsten Musikliebhaber zu erfüllen. Der VK-3000SE punktet mit Autorität, Mühelosigkeit und Souveränität, und das in einem kompakten Gehäuse. Just listen and see! Ausgerichtet an höchsten audiophilen Ansprüchen, wird der VK-3000SE mühelos seiner Rolle als Zentrale eines Ultra-High-End-Musiksystems gerecht. Er liefert souveräne 150 Watt pro Kanal an 8 Ohm und verdoppelt das an 4 Ohm-Lasten auf 300 W. In Verbindung mit BATs Röhrenvorverstärkersektion — basiert auf der Referenzröhre Sovtek 6H30 aus dem Flagschiff REX II — ergibt sich sublimste Kraft verbunden mit reichhaltigsten musikalischen Klangfarben. Der VK-3000SE ist vielseitig einsetzbar und lässt sich in nahezu jede gewünschte Systemlandschaft einbinden. Ein programmierbares User Interface erlaubt auf einfachste Weise die Integration des VK-3000SE in ein Heimkino-System. Quellenwahl, Polaritätswechsel oder Ausblenden der Musik geschehen mit nur einem Knopfdruck auf der Fernbedienung. Fügen Sie das optionale Phonomodul hinzu, und Sie gewinnen die Option für eine superbe Wiedergabe Ihrer Vinylsammlung, unabhängig davon ob Sie einen MM oder einen MC-Tonabnehmer bevorzugen. Die Ausgänge der Röhrenvorstufe verwenden Sie bei Bedarf, um einen Verstärker in einem anderen Raum zu bedienen. Viele Vollverstärker bieten zwar bequeme Bedienbarkeit, doch wenig darüber hinaus. Der VK-3000SE verfolgt ein völlig anderes Konzept. Schaltung und Aufbau übernehmen das kompromisslose Kaliber der Balanced Audio Technology Flagschiffkomponenten. Die Ausgangsstufe verwendet das symmetrische Bipolar-Design aus BATs Referenz, der VK-6200 Mehrkanalendstufe. Die Vorstufensektion nutzt wiederum die 6H30 SuperTube Unistage Designtopologie, (bekannt aus BATs "Special Edition" Röhrenvorstufen), inclusive der Verwendung der sehr teuren Papier-in-Öl-Kondensatoren. Das User Interface verbindet Flexibilität mit einfachster Handhabung, den beiden Eigenschaften, die es BAT erlaubten, hier den Industriestandard zu setzen. Selbst die beiliegende VK-R3 Fernbedienung besteht aus aus dem Vollen gefrästem Aluminium. Der verbaute massive Ringkerntrafo ist so gekapselt, das keine Störstrahlung in die Schaltung gelangen kann. Um ihn buchstäblich abzuschließen, erhielt der VK-3000SE noch massive Aluminumabdeckungen, die sein unverwechselbares Aussehen begründen. Innen wie außen, besitzt dieser Vollverstärker einen untadeligen Stammbaum. Der VK-3000SE, sein elegantes Design und seine technischen Fähigkeiten, dienen ausschließlich einem Zweck: der Musikwiedergabe. Jedes Verstärkers entscheidender Test ist sein Klang, und die Vorstellung, die der VK-3000SE bieten kann, ist atemberaubend. “Offen,” “filigran,” “geschmeidig” und “kraftvoll” kommen einem spontan in den Sinn, um seine klanglichen Eigenschaften zu beschreiben. Ohne zu zögern sagen wir, der VK-3000SE nimmt es mit hochwertigsten Einzelkomponenten auf. Letztlich sind hier also musikalische Finesse und superbe Performance, völlig kompromisslos einerseits, und doch, in einem einzigen, bequem handhabbaren "Paket", vereint. Sie sind herzlich eingeladen, dieses kleine Wunderwerk für sich selbst zu entdecken. Remember: All you need to do is listen. Dieser DAC ist unsere eindeutige Referenz, etwas musikalischeres haben wir bisher noch nicht gehört. Abmessungen (BHT) cm: 48,3" x 14,6" x 39,4"
Der REX DAC demonstriert wie lebensecht und berührend digitale Wiedergabe sein kann, wenn sie wirklich richtig gemacht wird. Die buchstäblich maßstabsetzende audiophile Glaubwürdigkeit dieses „Präzisionsinstruments“, ergibt sich aus der State-of-the-Art Technik, die sowohl in der digitalen wie in der analogen Sektion zur Anwendung kommt. Das digitale Design von Andreas Koch nutzt eine außerordentlich hohe Taktfrequenz, um möglichst sanfte, unmerkliche Filterung im Ausgang zu ermöglichen. Das Analogdesign von Victor Khomenko bildet eine Hochstrom-Vakuum-Röhrenstufe auf einem Niveau oberhalb vieler Referenz Röhrenvorstufen. Die Vermählung dieser beiden Entwürfe erlaubt natürlichste, analog anmutende Wiedergabe digitaler Aufnahmen. Damit definiert der REX DAC neu, was im Bereich DAC Design und Sound derzeit möglich ist. Das gegenkopplungsfreie Design erlaubt dem REX ein bisher ungehörtes Maß an Wärme, Natürlichkeit und Emotionalität im digitalen Bereich. BATs geschützte Unistage Technologie, Röhren Stromquellen, C-Multiplikatoren und Amorphkern-Transformatoren, massive Netzteile, verstärkt von zwei Ringkerntransformatoren, eine Transformator-gekoppelte Endstufe und ein Filter mit sanftem, unauffälligem Roll-off. Ob Ihr Geschmack nun in Richtung 384kHz PCM oder zu 11.2 MHz DSD tendiert, der REX DAC lässt damit Ihre Musik „vor Leben brüllen“. REX DACs analoge Ausgangsstufe folgt dem typischen puristischen Ansatz von Balanced Audio Technology zur Verwendung gegenkopplungsfreier Stufen zur Erreichung der gewünschten hohen Bandbreite und Schaltungslinearität. Weder Puffer noch Folgerstufen werden im Signalweg eingesetzt. Ein Paar der 6C19 Röhren dient als Stromquelle für die Stromversorgung des eleganten und geschützten Unistage-Designs. Genau wie im BAT REX II Vorverstärker erledigt im REX DAC ein Amorphkern-Transformator die Ausgangs-Kopplung. Im gesamten Signalweg finden sich keinerlei Kondensatoren. Proprietäres DAC Modul, betrieben mit einer "Ultra-High Clock Rate" unter Nutzung von "Custom Filters"
BAT’s Ziel für den REX DAC war es, die "unwiderstehlich natürliche" Reproduktion der musikalischen Quellen zu erschaffen. "Ringing" von Filtern kann eine falsche Lebhaftigkeit erzeugen, ist aber aus dem Design des REX DACs vollständig verbannt. Vielmehr entsteht durch die Verbindung der sehr hohen Taktrate mit eigens entwickelten Filtern ein analoges Signal, das REX DAC’s einzigartige Hochstrom-Röhren-Ausgangsstufe optimal ergänzt. HighEnd HiFi von Balanced Audio Technology jetzt als Testpaket zu Hause in aller Ruhe hören. Im HiFi-Studio ist man tief beeindruckt vom Klang der Komponenten und zu Hause klingt plötzlich alles ganz anders. Dafür kann es viele Ursachen geben. Die Akustik des Studios spielt ebenso eine Rolle, wie psychologische Faktoren. Damit Sie die BAT Verstärker oder DACs ohne Zeit- und Verkaufsdruck dort probehören können, wo es darauf ankommt, nämlich in den eigenen vier Wänden, bieten wir Ihnen ein Testpaket für eine 7-tägige Kennenlernphase an. So können Sie in aller Ruhe entscheiden. Sie erhalten das BAT Gerät in einem maßgeschneiderten Flight-Case inklusive aller benötigten Kabel. Ganz formlos: senden Sie eine eMail mit einer Kopie Ihres Personalausweises an die eMail Adresse bat-testpaket@cm-audio.net. Wir rufen Sie, gerne auch außerhalb der üblichen Geschäftszeiten, zurück und stimmen den Inhalt des Testpaketes ganz individuell mit Ihnen ab. Selbstverständlich stehen wir Ihnen bei Fragen rund um das Testpaket mit Rat und Tat zur Seite. Senden Sie Ihre Fragen einfach an bat-testpaket@cm-audio.net. Wir rufen Sie, gerne auch außerhalb der üblichen Geschäftszeiten, zurück.